The local rounds of the Delancey UK Schools Chess Challenge, now in its 20th year, have now been completed in a number of Suffolk schools (as well as the Bury Knights JCC). 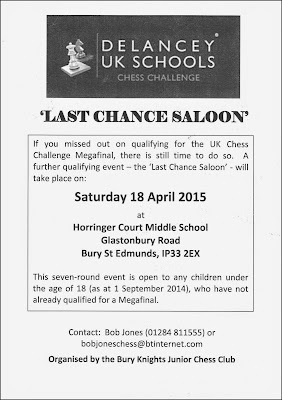 For children who were either unable to compete (perhaps their school did not enter) or who failed to qualify for the Megafinal, there's a further chance to do so by entering the 'Last Chance Saloon'. 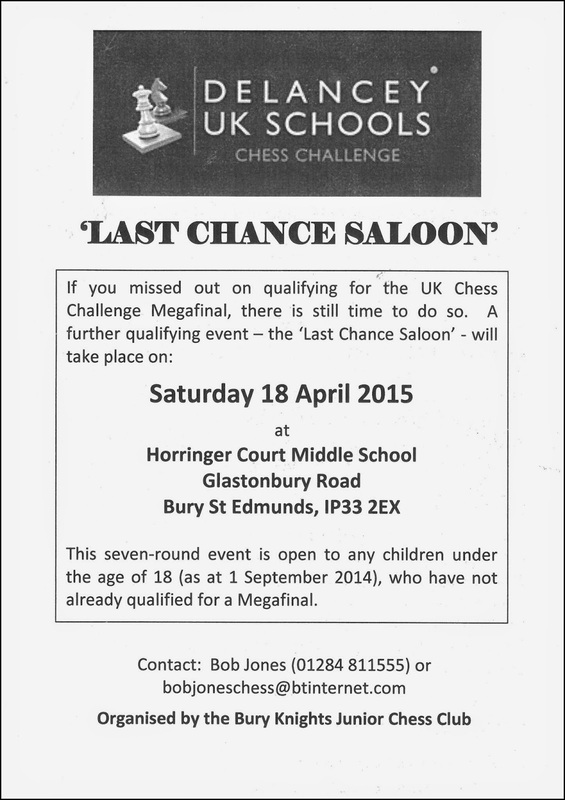 This event will take place in Bury St Edmunds on Saturday 18 April. Entrants will play all seven rounds, at 20 minutes per game for each player. The same rules for qualifying will apply and there will be badges and stickers for all as their scores progress. Contact me (Bob Jones) if you would like an entry form. The Suffolk Megafinal will be held at Woodbridge School on Sunday 10 May.